I start with a connection I made during TVCS, Laura Gogia. We have connected on Twitter over the last year and I have enjoyed her humour and warmth online over that time. She has been making stuff on Canva for a while and uses it a lot. I have tried it before but not been very patient with its interface. Today I used it properly for the first almost entirely as a result of her recommendation! I wanted to make a nice looking summary of Alec Couros’ post on open teaching, to situate this post, and her Twitter handouts came to mind. Here is my first result working with Canva and thank you Laura. I want to use Alec’s ideas on open teaching to unpack my learning on TVCS so far and how I have used its resources during a course on Mindful Communication I designed and ran and this semester in Blackboard. I found the idea of ‘thinning the walls’ helpful to engage with the difficulties of working in a closed Learning Management System for the first time in a long time. It will take many of these imperfect models and raw conversations to create and shape the future of education. Believe in the conversation, throw out your ideas, engage with others, and teach and learn with the passion that this process breeds. This is openness at its very best. summary of an ethos for open education that expresses simply what I see as the essence of TVCS. I remember some of the tentative early blog posts from the design team and some of the conversations about what it meant for a course to have so many titles and how on earth one could meet the ideals of a course of study on “Living the Dreams: Digital Investigation and Unfettered Minds.” I was honoured to have been offered the role of network provocateur during the course and, even before it started, this course had helped me reflect on my role as an educator. In what follows I will take Alec’s principles of open teaching and reflect on these were used in my teaching as I have sought to embed elements of TVCS into my own course. I have created a Vialogues of a conference presentation that sums up TVCS for those new to it reading this post. It is a presentation the TVCS team from Virginia Commonwealth University did a couple of weeks into the course. It speaks clearly to its pedagogy and intent. I will draw from this video in the reflections below and have annotated the video in Vialogues (time markers in this post refer to that). You rarely hear this about FERPA but it says that if a it is a pedagogically useful experience and no grades are posted publicly, then it is okay to work in the open. If people are doing amazing work then to my mind the burden of proof is on those who say that damage is happening. If you are clear with your students this is why we are doing it and this is the pedagogical purpose, then FERPA would not prevent it. It allows for situations where student need to perform. What about public music performances to test your metal during a live performance? FERPA does not prevent that. He argues that if we are clear, if we explain, if we do not publish grades and students can use a pseudonym then there would be no FERPA reason to stop me from working with open blogs for my students. Next time. We created an LMS course blog (primitive though it was) and got into a conversation with the institution about the importance of the permalink. I could not make them see that even in the closed LMS if we wanted to develop participatory collective thought we needed a way to make associative trails. I even asked Alan Levine to speak to its importance to help everyone understand its importance [podcast coming soon here, we futzed the video]. I wrote a blogging guide derived from DS106, Connected Courses and TVCS. 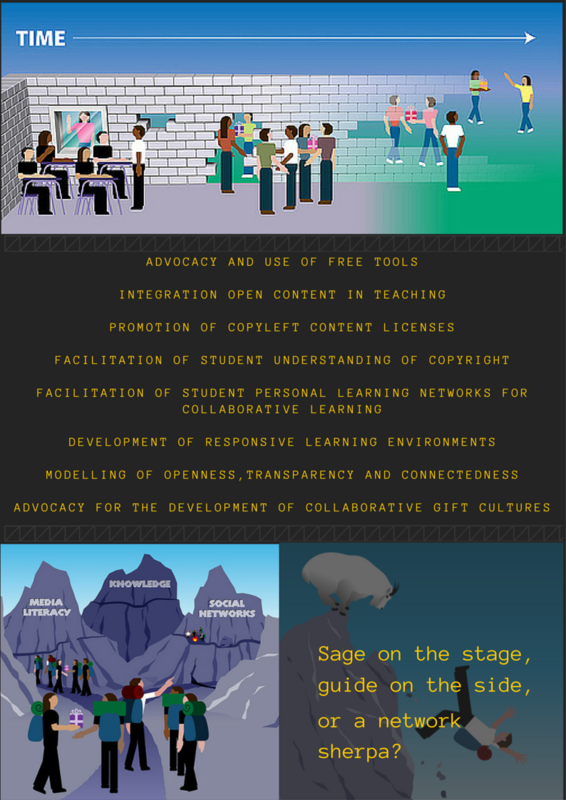 The Connected Courses Guide is an open resource I referred to a lot and my own DS106 post on commenting for learning to create the guide. I worked with students on the comments in the course blog and the discussion board to share this informations and lots of questions were asked and explored. As they learnt about multi-modality for blog posts (and embedding is as awkward in Blackboard as permalinking) they flourished. Blackboard does allow animated gifs and I encouraged them to design their blog posts as something that expressed their identity. We were never to meet in person, so all we had to communicate were our digital tools. We had better learn how to use them. I encouraged my students to think of the course blog as a collective dialogue space that allowed for much more than linear text. It was great to see them engage and learn and express their nuggets using so much more than just words and creating awesome blog post titles to grab attention. The whole issue of audience was a non-issue. I had gone against advise and insisted we created one shared space rather than individual blogs for each student. I insisted from day one: “Remember: If you are not among the first posters each week, please read the comments already posted and make connections to and build on others’ ideas while you stay present and express your own experience.” Very soon they were writing and connecting with each other and not writing for the professor. They brought into the space their outside online work as some had public blogs and/or an active social media presence. I used Vialogues, my own public blogs and Skype and encouraged them to continue using open source tools after the course ended. At the time of writing they are setting up their own Facebook Page. I used this suggestion to talk about about privacy and content ownership issues, I talk about this below. I created most course modules with open source content and media. In some ways I felt guilty that, unlike all the content in TVCS, all my content is behind a password and inaccessible. I published a few relevant posts on one of my sites and used Google Drive to publish some content under Creative Commons Licensing so that it is accessible to others as nothing from the LMS is. Here I wanted to compare the difference between using Vialogues with a TED talk and what came to be known in my mind as the ‘Saga of the Film’. I put the TED talk on Vialogues. I wrote details about the process for the students, explained they had to get an account, offered a quick tutorial from You Tube and a screenshot of how to delete the account should the wish to do so after the course. Time spent: 15 minutes. Compare that with this next story. Details have been removed to avoid boredom. I wanted to show a film that is old, very old. A film that was originally for educational purposes but which, unfortunately, was not on You Tube. The system kicked in. I asked about the film at the start of the semester. 8 weeks later I needed the film and nothing was organised. As different departments and organisations got involved to get us a license, much went wrong. I had to change the order of my material to allow time for copyright and licensing issues to be sorted. We were unable to use any annotating software as the film was under a paywall. We were unable to watch synchronously as we were told Blackboard Collaborate was not suitable (delay issues) and open platforms were not allowed with this particular film. I lost my will to live with the whole process several times. It showed me all that needs changing in the traditional licensing system and how important it is to design for open content and media. By contrast, TVCS has all its content available online for all of us to reuse; the videos, the essays, the blogs from faculty and students. I could easily integrate their content in my work. A true example of networked communities of improvement: faculty, students, design team, open participants, and now also my little mindful communication LMS community is aware of this work and has used it to develop unfettered minds! I encouraged them in the blogging guidelines to attribute as if open their blogs were open. In TVCS because students blogged in the open it is all available there. I asked Gardner Campbell directly if I could adapt his assignments. I could not find a clear license in a quick scan of the TVCS website or some of the students’ blogs. I imagine that it is implicit in the work as I know the people involved work with and promote Creative Commons Licensing. I am not sure I promoted anything but I did try to teach them about implications of different choices. I did teach them to search and attribute images, encouraged them to re-work blog posts to publish in the open, think about the copyright issues when publishing content within the LMS and what fair use might mean when citing copyrighted content. All of this was not required content, I responded to queries from my students about my comments on blog posts, or my own blog posts on the course blog. I used several videos and infographics that showed them the differences, why it matters and how to choose what was appropriate. This was a great element in TVCS for me. I am not sure about the jargon in the principle. I take it to mean support your students in the open web to keep learning and collaborating! The hangouts were precious, I got to learn so much about the history of this open web I have grown to love and be part of in the last few years. I met wonderful scholars who I am still in touch with and learning from. It was much harder to do this inside the LMS. I remembered the thinning walls metaphor and did my best to connect them with people, resources and tools ‘out there’ beyond Blackboard. Yet, the LMS creates a kind of learnt helplessness. It is as if students (and me too) park their online identities outside as they sign in. I experienced it as a profound sadness I could not bring in the people who had helped me learn how to augment my intellect through technology to the richness of our dialogue. A small story to illustrate how this plays out. A student who is active ‘out there’ feels the need to email me to ask if it was okay for them to have contacted one of the main authors we were studying on Linked In. The tone was as if I might say they were somehow cheating! I responded with an ‘of course it is fine, so glad he responded to you. All you need to do is cite your conversations as personal communication when you write your papers’. I supported Linked In requests that came into me, encouraged them to collaborate with each other (helping each other shape ideas for the final project, for example) and although they defaulted to a Facebook group to keep the dialogue going it was driven by them not suggested by me. I used the opportunity to to explore a domain of one’s own ideas and reflect on privacy and ownership of content issues by offering links to the work of my own collaborators and a rationale offered to me by another on Twitter: try it! It will be a place you manage and with no adverts! This principle is interesting to me out of the context of open online courses. TVCS clearly scored on all these criteria for me. It offered the whole gamut of possibilities on the open web with support from faculty to develop students and also role modelling of faculty themselves engaged in the learning process. The sense of discovery of the value of blogging in their conference presentation is obvious. I loved the Instagram Inquiry Project example and could see my students engaging in this open project idea if they were blogging on the open web. Bringing this element behind the walls of the LMS was a challenge but not impossible. Clearly if by environment we mean the technology, then Blackboard fulfils none of these criteria. Yet, I do not want this post to turn into a moan about Blackboard. I did enough of that on Twitter as I discovered its limitation at the start of the semester. Yet, if I think about the humans involved in a closed Blackboard site, I have to say we managed to do all of the above and more. How? We engaged in dialogue and worked through what was needed to overcome constraints for me to teach and for students to learn. So, whilst we had little control of the technology, we had control of our process of connection. We could enact in our text based dialogue what the course outline described. We used the technology available and worked with it to create a sense of collective learning even without permalinks! Alan Levine offered some thoughts on hyperlinking, I offered my discovery of Xanadu and the amazing story associated with it and Ted Nelson. My students read and listened to Doug and called him a ‘cool dude’. I shared Tom Woodward’s animated gif in Blackboard. What is of real interest to me is that in listening to the TVCS presentation in Vialogues and reading my own writing on this blog over time, I see an assumption that this process of connection is associated with working on the open web. I am starting to challenge my own assumptions here. The open web may have the potential to amplify connection, but the process can be taught in a more bounded space. My students taught me that this semester. The TVCS team talks about how the cMOOC design, using the idea of networked communities of improvement where all the members engage in the process of learning, ‘deconstructs power relations’ as experienced in the traditional classroom. They mention in their presentation how working with this ‘collective IQ process’ supports a different kind of relationship between teacher and students. I see all of this in the context of the open web, yet I found it surprising that it could also be created in the much more limited online space that is the LMS. Who were my students writing for? It may have started with blog posts as disposable assignments for the teacher. Yet, with a little guidance here and a blogging guide there they quickly built up associative trails and thought vectors that were richly rewarding for them and had little to do with grades. The one area where the limitation of the LMS could not be overcome is what Ryan Cales, in their presentation, talks about as ‘connected learning beyond the course’. He says that whilst at the end of the semester at the university everyone says ‘Have a great summer’ and disappear, your online friends don’t leave! You have people who can continue blogging with you and learning together. This is certainly easier on the open web. I have not seen how many students in TVCS have continued to blog and build connections – I know that I personally feel close connections with many of the people I got to know through TVCS. On the LMS people can continue to interact too although I cannot imagine the community will stay live. They are likely to move to Facebook and I am curious to see how the quality of dialogue changes and evolves with its affordances and no facilitation. Will, a TVCS student, said that one of the striking things about this way of working is that ‘comments of professors and students are all in the same place and this is a kind of leveller’. It kind of flattens differences in status. We are all doing it together in the same space. I thought that was an insightful observation. Of course, this is something that can be done in the LMS. I was surprised by an unwritten rule in my institution that said professors did not engage on the discussion board. Well, I soon broke that rule and I would say I did most of my teaching from there. Meanwhile, the IT department kept the content modules safe for…who knows? I have built relationships with people from VCU through DS106 initially and then through TVCS. 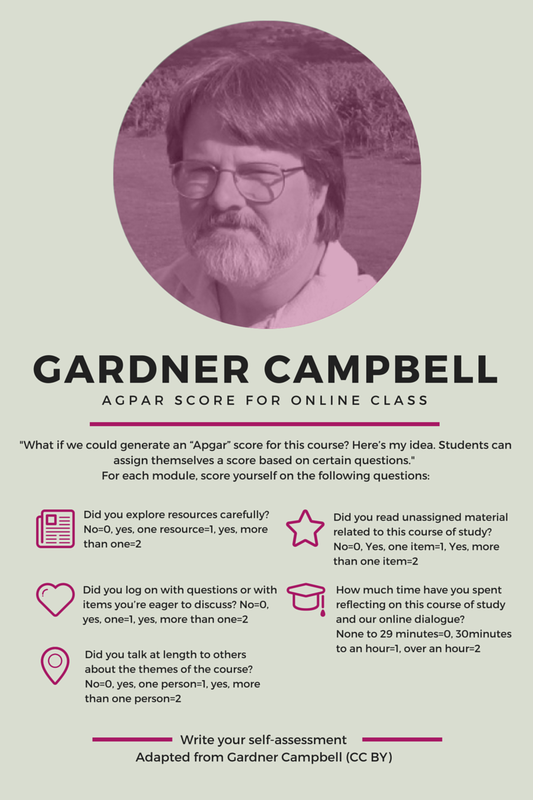 Gardner Campbell has been a linchpin into VCU from UMW where DS106 happens. I continue to learn daily from him and his passion for working within the system to change that system. Even when it seems impossible, he keeps going. I enjoy tweets I do not understand about sport from Jon Becker, I find Laura Gogia a joy to chat to when we do, I have to thank Ryan Cales for wonderful resources from his courses that I have pointed my own students to when they needed to learn about argumentation and research for final papers. Tom Woodward teaches me daily about ‘how big the Internet is’ and finds wonderful hidden gems he shares freely, I met Bonnie Boaz in TVCS and found her blog posts full of insight and fun we continued to learn together during Connected Courses. I have not spoken much with @wdeihl but have benefitted from his knowledge on Twitter. I met Cindy Jennings on TVCS although she is not from VCU she was an open participant then, I connected with her when she wrote a lovely post and lamented she could not make lovely gifs to go with it. I can do that and made a few gifs for her. I know little about her but learn from her on Twitter also. In a sense I brought all of you into my closed LMS world. Without all you taught me or pointed me to my transition back into the LMS would have been much harder. I am grateful to you all even though you may not even have known I felt supported by you. My starting point with my students was not the same as VCU students on TVCS or even open participants on it. I was starting with a group of people who could not be further from being digital students. Some had even signed up on my course thinking the course was face to face rather than fully online. It was a great opportunity for putting into practice this principle. I simply said this is a difficult situation for all of us vis-a-vis technology. We come from opposite ends of the spectrum: me struggling with a closed environment when I advocate open online education, you struggling with an online environment when your preference would be a classroom; me expecting a level of digital literacy after being told ‘there were plenty of tutorials on how to use the system’ and you hoping this course would allow you to get grades by following a few unambiguous and unthinking steps. The more I reflect on where we all started, the more inspired I am by my students and what we created in our ‘little course site’ as I came to call it. I did my best to explain about open education and the rationale for my preferences, and to model working around limitations of the technology jointly and transparently…although there were times, such as when Blackboard refused to let me upload anything on Monday morning most Mondays, where I might have sent an announcement with a photo of my dog growling to show how frustrated I had been; I might have stuck a link to my public dropbox for them to download my weekly welcome from instead of uploading to the site. I brought my students to the Still Web and they commented on some of my posts there. I hoped this would give them a way into thinning the walls of the LMS. I took Gardner’s concept experiences and nugget assignments into the course and it was like he was teaching with me. Towards the end of the course I decided to use Gardner’s Agpar Score to help students write their self-assessment report. I guess this was less about TVCS and more about Gardner but it is in the spirit of TVCS. I had created a little ‘thing’ in Canva for the students and I now have made it public on Canva for remixing. I once again find myself responding negatively to this ‘advocacy’ word. I more believe in inquiring about obstacles to collaborative gift cultures and exploring consequences of to gift or not to gift, but may be I am splitting hairs. The course was about mindful communication through the use of insight dialogue so I believe it teaches about communication in collaborative gift cultures. We practiced but I did not advocate, if by that it is meant me talking about its importance. I showed but did not tell. We had enough frustration amongst us to create adversarial conversations. Expectations were very different, we came from a multitude of cultures, I had graduates and undergraduates join the course, technology did not play nice and to top it all I was requiring my students to engage with each other and the course with deep interpersonal attention. They will not mind me saying, that at the start this was in opposition to lifestyle needs to get it all done quickly on a Sunday night before the next module came out. I did my best to explain the pedagogical reasons for asking them to engage mindfully with our text based dialogue, every word typed was a chance to practice the topic of the course! Enact the content through your writing. Yet I was clear that this was a very big ask and beyond what could be counted by final grades. Nobody would be looking at how they approached their computers. I just made that request. Did we really pull this off? I do not hesitate for a moment to say: YES! I wrote to Gardner at some point that I wished I could open up our little course site so he could see the wonderful dialogue and collaborative gift culture we created. I was surprised to know that they had not worked together before to help each other refine ideas for final projects, I just offered a discussion space, some useful questions to ask each other, the Kantor dialogue model to help reinforce the need for engaging beyond just telling people how great their ideas were. You can read a lot and pay a lot for this model but it boils down to this very simple and beautiful original poem by David Kantor. I modelled this by offering feedback on the discussion board rather than privately on email and anything I asked them to do, I did it first to show them. I blogged and discussed our process openly within the course site and asked the students to support the process in the form of ‘let’s together create an interpersonal meditation lab’ where we can practice text-based dialogue. So much of our communication is text-based, this is about more than just passing the course. We made it work even though we did not have some of the things we take for granted in open online experiences. For example, as the course blog in Blackboard did not support permalinks, I explained the intent and the meaning of hypertext in the context of a collective thought process. They could not do permalinks but they cited and linked each others’ work in creative ways: quotes, blog post titles, dates, discussion board links… I explained that the process of text based dialogue needed us to learn a new language which in the open web we call digital literacy. Actually I renamed it. I called it digital fluency. It seemed less value laden. I only did one module on thought augmentation working through some of the TVCS syllabus. I embedded it within our work on Bohmian Dialogue and interpersonal meditation. How could the collective IQ process be related to participatory thought and speaking from the pause rather than the ego? In the words of one of my students, after this module they realised that “through the internet it was possible to see different aspects of reality. Everything is connected, nothing is absolute and all is relational.” And this was just my hope! That in learning to be passionate about digital inquiry, they could see that the spirit of interpersonal meditation can be embedded right here – always holding a question rather than seeking to prevail with our pet answers when we interact. My list for engaging contemplatively online was one of those using the publish and then filter model! I have done little in the open web to implement it. I have learnt to be much more humble in the LMS and seen just how hard it is to teach students about the importance of making one’s own list for mindful digital engagement and even before doing that learn about the importance of resisting the divergence of attention that online life makes so easy. Commenting on one of my students’ blog posts about the wonder of how they took instruction to heart and through their account of the ‘why concept experience’, as they came to call it, showed themselves and others how the habit mind works and how hard it was to resist the divergence. I am only starting to explore the challenges and the dynamics of teaching from silence or the ‘tacit space’ as one of my students called it. I see now what Nick meant when he said recognition was needed. Once that is in place the hard work starts and, if we have the commitment, we practice with each word we type or at least learn to realise that most of the time we just type from habit! Dialogue, thought vectors, living the dream, inquiry and the craft of argument, unfettered minds development…. We are teaching in the same concept space from different disciplines! I only see this now putting together these reflections. Living the dreams of the original thinkers by teaching mind to augment in collaboration with others and technology even when fettered by Blackboard!